How palm sugar is made. Have you ever wondered how palm sugar is made? I always have. Few months ago I met a very nice Khmer farmer who kindly showed me how to make palm sugar. It happened in Cambodia during my holiday. While I was riding a rented scooter through the countryside, I stumbled on a little village right outside Kampot. 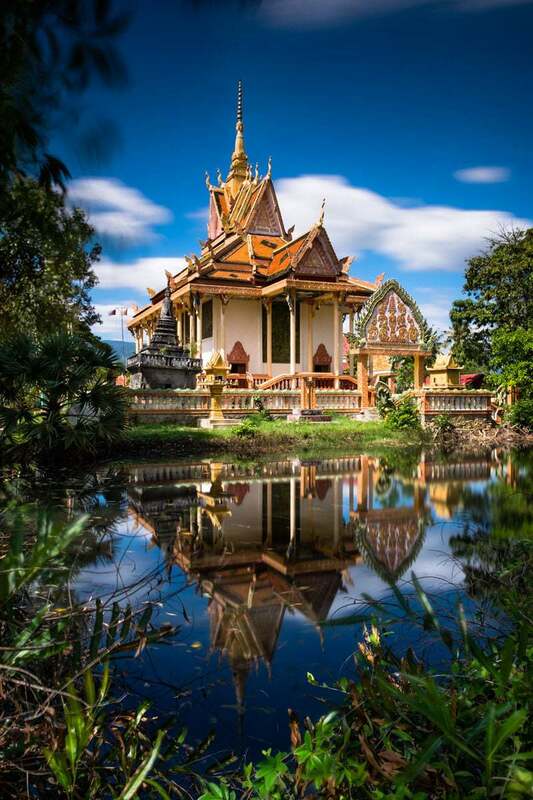 I stopped at the end of an unpaved road that leads to Kampot river where there is a small colourful Buddhist temple with a tiny pond next to it. I mounted my camera on my tripod, I took my ND filter and shot few long exposure images of this cute little temple standing in front of me. Buddhist temple by the Kampot River. 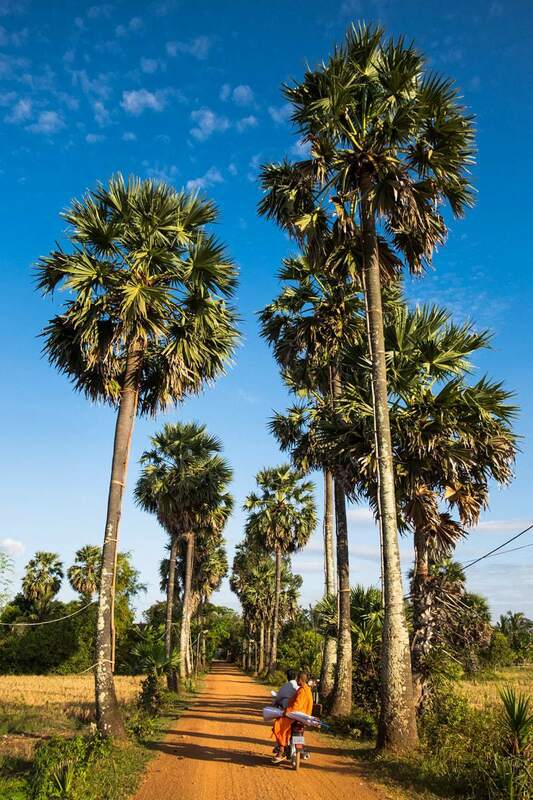 Once I was done, on my way back I saw a Khmer farmer who was about to climb on one of the palm trees that were on both sides of this dirt road. Buddhist monk leaves the temple, by bike on a dirt road with palm trees. Kampot, Cambodia. I stopped there, then he smiled to me. I took my camera out of my bag and started to take pictures of him. He had some empty cylindrical containers that he hang on the palm tree to collect the sap over night from the flower. Later he invited me to go back the next morning to show me how to make palm sugar. 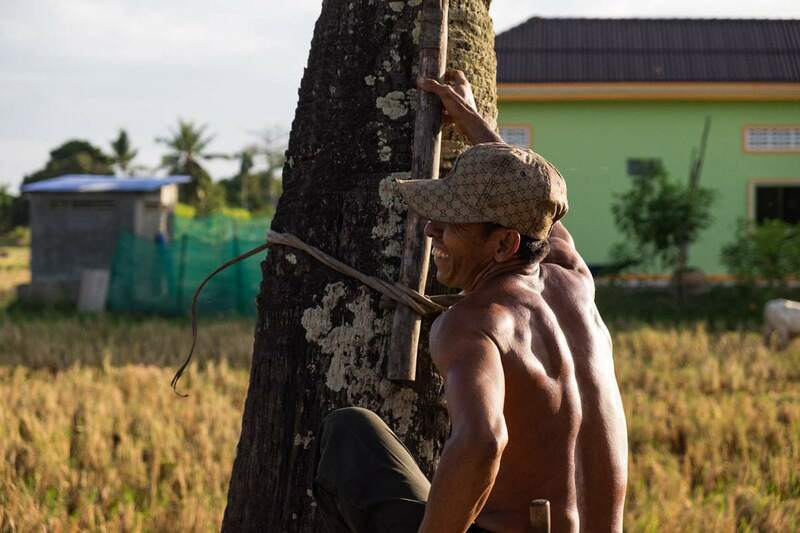 Khmer farmer climbs to the top of a palm tree to attach the tubes to collect the sap from the flower. Next day I found him there collecting the containers filled with juice. Some people with empty plastic water bottles stopped by and bought some of the sap off him. A customer with empty plastic water bottles buys some of the sap off him. Later he offered me some to try. He then asked me to follow him to his home to see how palm sugar is made. How to make palm sugar. Once in his sugar shack, opposite his house, he finally showed me how to make palm sugar. He emptied the containers with the collected sap into a large pan shaped like a wok. During that process the liquid gets filtered to eliminate any residue. He empties the containers with the collected sap into a large pan and it gets filtered to eliminate any residue. He makes sure the containers are completely emptied. His wife then joined in to set the fire under the large pan. His wife sets the fire under the large pan. The sap boils until it thickens. When it is ready it reaches a brown colour. The palm sugar is made now and the process of dehydration begins. The fire stove with the boiling sap. In conclusion, it was a great experience to see first hand how palm sugar is made. But greater is the hospitality I receive from Cambodian people every time I’m in Cambodia. That’s why I’m always happy to spend my holidays there and get to know their culture. Similarly, you may also be interested in my portfolio about Cambodia.